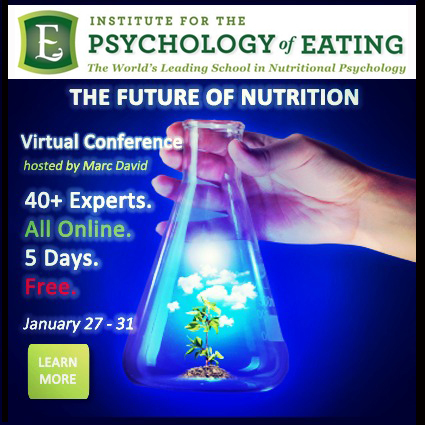 Last week I had the pleasure of hearing from several leading doctors, health practitioners and thought leaders as I attended the online Future of Nutrition Conference, which was presented by The Institute for the Psychology of Eating. I wish I had enough time to hear every speaker but unfortunately my schedule only allowed me to listen to a few people each day. The ideas presented were both progressive and insightful and I thought it would be nice to share some notes from most of the presenters that I did listen to. I’ve linked to the websites of these experts (just hover over their names to see the link) so you can discover some new resources for information on the important topics of nutrition and nutrigenomics. There were plenty of overlaps and I learned a lot. It’s possible to purchase the entire conference, which includes all 50+ interviews in video, audio and transcript format for just $149 if you purchase by 11:59pm (EST) Monday, Feb 3! The price goes up to $249 after that. In the meantime, you can listen to some encore presentations for FREE until 5pm today here. Inflammation underlies every health condition. Candida can be systemic. It’s very dangerous but can be brought under control. It produces acetaldehyde, which is a chemical compound usually produced when a person drinks alcohol. Toxins and being sick can cause us to be bloated and look puffy. There is “stealth sugar” in food products like pasta sauce, salad dressing, bread, crackers, pretzels, chips and cereal. There’s nothing wrong with human physiology, the problem is with our environment. When enough of us vote at the cash register that we’re only eating the good stuff, food companies will stop buying it. Has a wonderful concept in Clean Plates – helps you find healthy, sustainable restaurants in New York, Los Angeles and Austin. Most patients undergoing traditional cancer treatment are missing out on the nutritional and lifestyle practices that are essential to their recovery. Have their treatment and then are told nothing, see you in six months for your next scan, when there are numerous and extremely important things that they could be doing in the meantime to prevent reoccurrence. Remember, you can purchase the entire conference, which includes all 50+ interviews in video, audio and transcript format for just $149 if you purchase by 11:59pm (EST) Monday, Feb 3! The price goes up to $249 after that. In the meantime, you can listen to some encore presentations for FREE until 5pm today here. The Institute for the Psychology of Eating also has other great offerings, including their Eating Psychology Coach Certification Training and a breakthrough public program, Transform Your Relationship with Food. Disclosure: I am an affiliate of The Institute for the Psychology of Eating and will receive a small commission from the proceeds of any sale made via the institute’s links in this post. Be assured that any income goes to maintaining the free information I provide on this website.